I spent the last couple weeks out on the east coast, mostly in New Jersey, and I decided to take a few shots of my old hometown. I actually didn’t live there all that long, but they were those ‘critical’ high school years. All in all the town doesn’t look much different from thirty years ago. It’s known for it’s slate sidewalks and gas lamps. There’s a quaint old train station at the center of town. I went to a grand old Middle School for 6th-8th grades. By Curt | Posted in Urbanism | Comments Off on Strawberry Tarts! Rainbows End is a new sci-fi novel by Vernor Vinge. I read it during the trip to Vancouver and back, which seems sort of fitting since Vancouver seems like a relatively ‘future’ city. The plot is the fairly standard ‘big world-threatening event’ kind of stuff, with the day saved by a little girl even, so it’s just enough to keep you going. The depiction of life in 20 years from now does have some interesting ideas however. The young characters are all fully immersed in virtual worlds enable through wearable computing, and in fact in most spots there are many simultaneous virtual ‘overlays’ on the actual world. Medical breakthroughs help to keep people alive, at the cost sometimes of losing their former skills and traits. There’s a high degree of surveillance and military presence, perhaps unsurprisingly. There’s a constant hum of so-called ‘sming’ (silent messaging), though it’s a little hard to see how people could multi-task through real-life conversations and sming without losing the thread somewhere. I’d recommend it if you’re into the futuristic stuff, otherwise not. While in Vancouver I was able to catch Ray Davies & Band at the Commodore Ballroom on Granville St. It’s a nice upscale venue, with a big floor and plenty of tables and chairs to the sides. Ray played a combination of old Kinks favorites and tunes from his solo CD “Other People’s Lives”. I found the band sounded pretty muddy, and it was not always easy to make out what Ray was saying, but in any case I enjoyed the show. The old songs like “So Tired” and “Set Me Free” were great to hear, and the new material held up pretty well. I’ve only listened to the CD once so far, but I’d say it’s good. I made a quick trip up to Vancouver, British Columbia via train and bus. The Amtrak train from Portland to Seattle is quite nice; both stations are well-located, there are only a few stops, the views are nice, and the price is good. For some reason there is only one train a day from Seattle to Vancouver, and the other connections are made via bus. The bus is OK, but going through customs is a drag. Anyway, I hadn’t been to Vancouver for a tourist visit since about 1990, so quite a bit had changed. Mostly, lots and lots of 20-30 story apartment/condo buildings, built of concrete and glass. Almost all the buildings you see here are new, built in the last 10 years (that’s the Granville St bridge and the Yaletown area behind). There are great views in most directions in Vancouver, so it’s understandable to build up. But somehow I found a lack of planning down at the ground level. In very few spots did I see a lively mix of commercial uses on the street. Mostly it was just entries to these buildings. Most of the public use areas are concentrated on the ‘seawall’ next to the water, where they have great bike paths and walking paths (separated usually, which is nice) all along the Stanley Park, the beach, and these newly built areas. The place is starting to feel a bit like Hong Kong to me – so much vertical living space. Personally I don’t find it so appealing, to live in a high-rise (too much exposure to J.G. Ballard I guess), but obviously many do, especially when there’s a view of water or mountains or both. Ideally though I think it can be done with more attention paid to the street and the pedestrian experience. The newest parts of Vancouver are too close to the Le Corbusier ‘contemporary city’ for my taste. Yes, the youth came to town. Nice show, the band seemed to be loose and having fun (a little too loose at times – Thurston blew it a couple times, claimed “there’s nothing worse than a perfect band”). Played at least half of the new record, along with “Tom Violence” and “Schizophrenia” among others. Ex-Pavement Mark Ibold on bass. In recent weeks I’ve seen three films that link together in certain ways. The first was Point Blank (1967), with Lee Marvin and Angie Dickinson, directed by John Boorman. Not a success when it came out, but influential for its tone, the use of color, the non-linear, sometimes dreamlike, plot. Read more about Point Blank. The next film directed by Boorman also starred Lee Marvin, along with Toshiro Mifune, and it was titled Hell in the Pacific (1968). This is a strange film, particularly coming from MGM. The two men are alone on a tiny Pacific island, and can only talk at each other. So there’s no real dialogue. At this point it feels like a strange out-take from a Survivor episode or something. 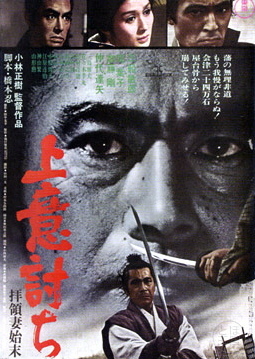 Then last night I saw Samurai Rebellion (1967) at the NW Film Center. This film stars Toshiro Mifune, and is in black and white. Right from the start the story puts the characters into a tighter and tighter bind, trying to resolve their own honor and morality with the orders of their lord, while also worrying about the impact of their decisions on family. Lovely images and photography. Read more about Samurai Rebellion.